I've just spent the past few days at Oracle OpenWorld Asia Pacific in Shanghai. Although of course a smaller scale to the one coming up in San Francisco in November, I think there were 8000 or so attendees and in true OOW style, each session slot presented the challenge "which of these 10 concurrent sessions do I want to attend?!" Innovation was one of the key themes of the conference and Charles Phillips' keynote. 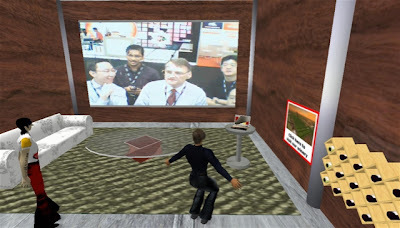 And I think there was no better illustration of this than the demo that the OARDC team were showing in the demogrounds. It got my "best in show" vote! Their Second Life "Innovation+ Village" show-cased a solution concept bridging the real and the virtual worlds, and they brought some interesting ideas into play. The scenario was a Second Life wine store. In the room you can examine the products and get some gratuitous live-video. But then you can make purchases (using Linden$), which are captured in iStore for delivery in "real life" (I hope .. still waiting for my case of Bollinger;-) BI dashboards track order volumes and status. Then back in Second Life, you provide feedback on the wine purchased. The feedback is not only collated in Oracle Database for analysis (more dashboards), but also fed into a blog of comments on the particular wine (WebCenter). Overall, a great example of an "Enterprise Mashup". I don't think the team created any new technology pieces, just a novel solution using a combination of available components and APIs, and provided the content. While you may doubt the financial viability of doing business in Second Life, it does emphasise the fact that creating Enterprise 2.0 value for your organisation does not necessarily involve a huge development investment. Just as a great artist can produce a masterpiece with a child's paintbox, real solutions are possible today if you have the imagination and creativity to combine the youthful "Web 2.0" component palette with your existing IT infrastructure. Congrats to the crew from OARDC that put the solution concept together - Lennard Low, Teo Kian Hui, Wang Rong Rong, Zhang Rong (I believe this is a group photo below) and thanks Rong Rong for the demo;) Hope you get to show this in San Francisco too ... make sure you get a more prominent space in the DemoGrounds though, and don't have the screen facing away from the entrance!